On October 7, Pope Benedict XVI declared the 34th and 35th official “Doctors of the Church” — Hildegard of Bingen and John of Avila. The latter was a crucial figure in the sixteenth century reform of the Church. Hildegard, born in 1098 to a noble family in what is now Germany, is more remote, but extraordinarily compelling for her unique genius. 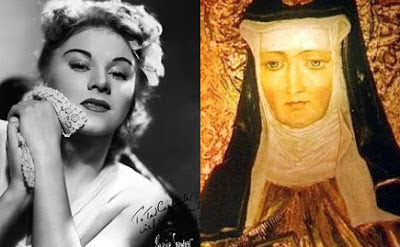 On the day she became a Doctor of the Church, I recalled another musical Hildegarde of our own day. Hildegarde Sell, born in 1906 to a German-American family in Wisconsin, started the fashion for some entertainers to use only one name, and she became the most famous cabaret singer of her time as “The Incomparable Hildegarde.” She first appeared in films in 1933 and was the first person to sing on the new medium of television in 1936. King Gustav V of Sweden and the Duke of Windsor were devoted to her, and she was enshrined in song by George and Ira Gershwin. She appeared on the covers of Time and Life magazines, advertised as the most expensively dressed celebrity of her day. Like her patron saint, she wrote about herbal remedies, though she was more interested in their cosmetic properties than was the Doctor of the Church. Thank you, Fr. George, for debunking some of the untruths in the popular image of St. Francis. But may I pick up on your claim that the so-called 'Prayer of St. Francis' is semi-Pelagian? The whole idea of being an 'instrument' (a more exact translation of the original French) of God's peace seems to be the opposite of Pelagianism, so far as I can see. I'm glad I read this piece. I learned a thing or two. I live in a very liberal urban area. It is very common to see statues of St. Francis in neighbor's yards. It's also common to see statuary here of the Goddess Gaia and Tibetan gods. My neighbors think of St. Francis as a hippy god, I'm afraid. Also, I'd always thought it was Saladin who Francis had visited. I stand corrected. There's good reason why I omit the so-called "Prayer of St. Francis" from my classroom when I teach college freshmen about medieval Christianity. Instead, for "St. Francis Week" (which follows weeks on the Rule of St. Benedict, the Investiture Contest and St. Hildegard of Bingen), we (critically) read selections from Thomas of Celano's "Life of St. Francis", along with a review of the Gospel passages on apostolic poverty and the preferential option for the poor (which can come as a shock to middle-class Americans raised on the Gospel of Prosperity). St. Francis was also not an ecumenist, as he had firm words against those who would depart from the Catholic Faith. He is also credited of having converted the Sultan to the Faith (which he preached to him), albeit on his deathbed. Not long ago I suggested to a Protestant Franciscan that to be Franciscan is to be in union with the Pope. This "friar", as he called himself, was not the least bit sympathetic to my position. "You don't know what your talking about mister!" was his retort, though he was forthcoming with no historical evidence to support either my ignorance or his position. Father, could you please expand more on the "Prayer of Saint Francis" and how it is semi-Pelagian? I'd like to understand this better. "A pacifist? ...May Saint Francis be our model in how to deal with the threats of our own day: not enfeebled by sentimentality and relativism, but armed with a Franciscan zeal for the conversion of souls. We may not have Francis’ charm, but we have in our hearts and churches the same God." “I enjoin on all my brothers [and sisters] whether clerical or lay, as they go about the world or stay at any place": ..."The Lord says: "Look, I am sending you among wolves like sheep You are therefore to be as wise as serpents and as simple as doves" (Matthew 10:16). For that reason whoever of the brothers [or sisters] wish on Divine inspiration to go among th Saracens and other infidels, may go there with the permission of their minister and servant. The brothers [and sisters] who go, however, may conduct themselves among them spiritually in two ways. One way is not to start grief and contention, but "be subject to every human creature for God's sake" (1 Peter 2:13) and so profess themselves to be Christians. “I have done what was mine to do; may Christ teach you what you are to do." Earlier this Month in Joplin, Missouri, a Mosque was burned to the ground. It didn't make many media reports, but perhaps that is fortunate as I suspect many Catholics would cheer. Are we called to be evangelists or exterminators? I suppose it might have been the massacre of the Sikhs (they wear turbans, so are 'towel-heads') in Wisconsin a few days earlier. Did Francis approve of hate, anger, revenge?